Oh boy, I have so much I want to say here on this blog. So many thoughts to share and so much to document. In all this business trying to freeze time sometimes I freeze myself and become paralyzed with so many pictures to sort and things I want to share. I just switched over to this thing called MarsEdit when I post pictures (Blogger condenses pictures all funky and it's bugging me how blurry they can look), so I switched over and just started getting in my groove with them and now that platform isn't working with Blogger anymore so I'm back to square one. Which slows me down more. The last couple weeks have been filled with Spring Break and also a quick trip to Utah to see Max's last home games and now I'm back to try to get some semblance of order around here...and to fill up our empty fridge and cabinets. Our whole group was certified to scuba dive by the end of this day, kids and adults who were scared to death to begin with included. We took the ferry over to Cozumel to meet our scuba guy and we were off to a bad start since everyone got pretty seasick en route. Grace was having some bad stomach cramps and we were crossing our fingers this could still go smoothly. But we made it, and I hope I will always remember sinking down into that vividly clear blue with so many people I love, bubbles floating up. Swimming through little caves lined with towers of so much beauty, huge corral fans waving at us and those huge trumpet things protruding out to us, fish that take your breath away with their unique designs. I bet the art of creating that fascinating underwater world was pretty fun for God. 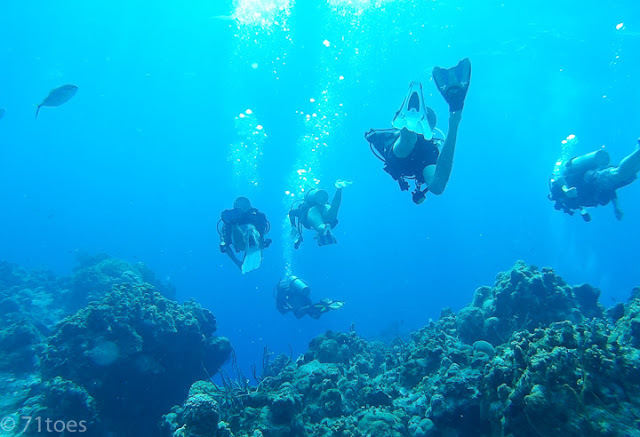 We had two of my favorite-ever dives, saw so much including a giant eel as well as a lobster as long as my leg, but my favorite part was rolling on to my back and looking up at all those brave people in newfound awe of all that under water glory. Grace and I were scuba buddies and were the last ones to come up on that last dive, not wanting it to end. I took a few extra seconds to take in the beauty of the sunny water surface above me before we both surfaced and let out a giant cheer joined by everyone already on the boat. I wished I could have hoisted Dave on my shoulders for working this scuba certification out, because that sense of accomplishment and triumph in all those faces that greeted us on the boat was priceless to me. I was so proud of Lucy for just hanging there on the boat trying to sleep while we were diving, no complaining. And Grace and Claire were so full of thanks for everything all night, their eyes glowing with that big thing they were able to do. We said our goodbyes to our awesome scuba guy as the shadows stretched to elongate all the boat masts in the dock and the sky turned pink around us, and we caught taxis back to the ferry. There was extra traffic right at the marina so we had to get out and RUN to catch that ferry, all of us including Lucy just flying to make it in time, Lu with one shoe off and one shoe on, determined to get there so we could have enough time to play scum back at the hotel for our last night. We all made it, breathless and huffing and puffing with big smiles on our faces literally with only seconds before they pulled in the boarding planks and we talked on that bumpy ride back to Cancun with the sunset sky taking my breath away. It was a good day. More soon! I ran into photo quality issues on blogger before but then I found this little tip on the Designer Blogs website and it works like a charm. That being said, I have heard wonderful things about Wordpress but every blog I know that has moved has had tons of broken links and missing pictures from old posts. Not sure if that can be fixed or prevented or not, but something to think about. Do you ever have a weekend of just being home with no one in the house but just family, and not as houseguests.. playing cards, going to church, eating together, no games to watch, no hikes? Lounging about the house. Lucy would probably love it. I'm just guessing, based on my own blogging preferences, but they probably do have several weekends where they just stay at home, but she doesn't blog about them because they're not really anything "memorable." I'm just catching up on some of your older posts and saw your question about switching a Blogger blog over to Wordpress. While doing this directly you might experience a lot of issues with missing links and photos, but you might consider building a Wordpress blog and linking your Blogger blog into it. I have both and have done this to make both accessible to visitors and subscribers in one place. I run a Wordpress site and blog together with my husband (www.flybynightpress.com) but have linked my design portfolio blog into it on a site page that's connected with a menu option called Cover Design (https://flybynightpress.com/cover-design/). If you built a Wordpress blog, you could maybe make a link called 'older posts' that would take visitors directly to your blogger blog. You would need to migrate your subscribers, though, but I think that could be done much more easily than moving the entire blog to Wordpress.